In this course, I explained in as much detail the principle and device of the most popular synthesizer SERUM. In the course, I tell and show in practice how to wind this or that sound in this wonderful synthesizer. 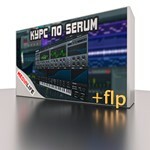 If you decided to thoroughly study any synthesizer, then I would recommend SERUM. With the help of it you can wind almost any sounds, for any styles of music. Duration of the course is about 2 hours. The cost of the course is from rubles, but you can specify any amount that you think is necessary. I would be very grateful if you would evaluate my work for its worth, after all over each of the courses I worked for more than one day and tried to explain all the information as clearly as possible. In the archive there is a document with links to downloading the course and other necessary information.